New York: Macmillan Publishing, 1974. Hardcover. Small 4to. 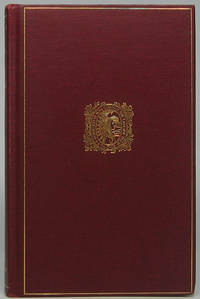 Burgundy and tan cloth with gilt spine lettering, pictorial dust jacket. xxi, 454pp. Illustrations, maps. Near fine/near fine. A superb, tight first edition of this volume in general editor Douglas Edward Leach's well-regarded "Macmillan Wars of the United States" series. Appropriate autograph addition: Tipped to the front flyleaf is a "San Jacinto 1836" 22-cent U.S. postage First Day Cover signed by its artist, Don Adair (1948-2010), 6½" X 3½", postally cancelled on 2 March 1986 in San Antonio, Texas and with "First Day of Issue" also stamped. Adair signs boldly in black ballpoint just left of center. Tipped above this is a portion of the envelope in which Adair transmitted this, with his signed return address at upper left. New York: The Macmillan Company, 1969. Hardcover. Small 4to. Green cloth with gilt spine lettering, pictorial dust jacket. xvii, 442pp. Illustrations, maps, map endpapers. Near fine/very good. Faint jacket edgewear; abrasion at front flyleaf upper right (likely from bookplate removal); light circular blind-embossed onership imprint on title page. 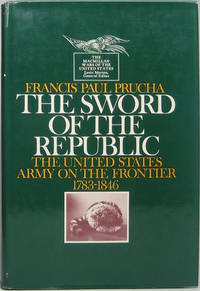 A superbly tight and nice first edition of this volume in the notable "Macmillan Wars of the United States" series. New York: The Macmillan Company, 1967. Hardcover. Small 4to. Bluen cloth with gilt spine lettering, pictorial dust jacket. xiv, 688pp. Near fine/very good. Faint jacket edgewear. Quite tight, handsome first edition of this volume in the notable "Macmillan Wars of the United States" series. Front flyleaf bears nifty "US Army Military History Research Collection" bookplate "Presented by" (typed) "General of the Army Omar N. Bradley." New York: Macmillan Publishing Co, 1973. Hardcover. 8vo. Red cloth with gilt spine lettering, pictorial dust jacket. xv, 462pp. Illustrations, maps. Very good/very good. Faintest of binding edgewear and faintest of jacket edgewear. A tight and handsome first edition of this in editor Louis Morton's "The Macmillan Wars of the United States" series. 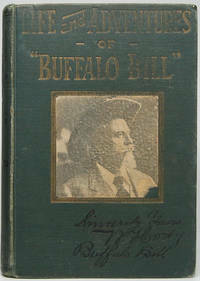 Life and Adventures of "Buffalo Bill." Chicago: Stanton and Van Vliet Co, 1917. Hardcover. Small 8vo. Dark green cloth with black and gilt lettering and gilt-bordered pictorial plate to front board. xiii, 352pp. Frontispiece, numerous small and full-page engravings. Good plus. Binding rather rubbed and mildly edgeworn; endpaper somewhat age toned and foxed. A tight and decent first of this posthumous edition, internally bright and near fine, being expanded from the true first 1879 edition and with a new preface and closing chapter by Colonel William Lightfoot Visscher. Subtitle says it all: "This Thrilling Autobiography Tells in Colonel Cody's Own Graphic Language the Wonderful Story of His Long, Eventful and Heroic Career and is Supplemented with a Chapter by a Loving, Life-Long Friend covering his Last Days, Death and Burial" -- and if that's not enough the sub-subtitle goes into greater detail! Chicago: R.R. Donnelley & Sons, 1949. Hardcover. Edited by Milo Milton Quaife. 16mo. Burgundy cloth with gilt lettering, rules and decoration. xlv, 383pp. Top edge gilt. Map frontispiece. Very good. Endpapers rather age toned, though otherwise near fine. Tight and bright 47th volume in the annual "Lakeside Classics" series of Americana reprints, keepsakes produced for customers and employees. Chicago: R.R. Donnelly & Sons Company, 1939. Hardcover. Edited by Milo Milton Quaife. 16mo. Burgundy cloth with gilt spine lettering, rules and decoration. ix, 337pp. Top edge gilt. Tissue-guarded frontispiece, illustrations. Near fine. Tight, handsome 38th volume in the annual "Lakeside Classics" series of Americana reprints, keepsakes produced for customers and employees. Laid in is the pristine "With the Compliments of the Season" calling card of Donnelley president Thomas E. Donnelley. "One of the most readable books about Arizona," notes Graff of the 1908 true first edition. GRAFF 4028. HOWES S 1132. Chicago: R.R. Donnelley & Sons, 1931. Hardcover. Edited by Milo Milton Quaife. 16mo. Burgundy cloth with gilt lettering, rules and decoration. xl, 384pp. Top edge gilt. Tissue-guarded frontispiece, foldout map. Very good. Faintest of binding wear only. Tight, handsome 29th volume in the annual "Lakeside Classics" series of Americana reprints, keepsakes produced for customers and employees. First of this edition under this title, the original and much larger true first edition published in London in 1801. Tombstone, AZ: Tombstone Epitaph, 1959. Paperback. 8vo. Stiff yellow wrappers. 65pp. Illustration. Very good. Faint wear to wrappers, else internally tight and fine. Tight, nice second printing of (to cite title page) "The Truth about the OK Corral Gun Fight and other events in which Wyatt Earp and his brothers participated. This is the story compiled from the files of the Tombstone Epitaph for the years 1880-81-82, as told by this newspaper's early editors." Confused reader pens notes on rear wrapper trying to untangle who shot who, who died where, etc. Tucson: The Tucson Rodeo Parade Committee, Inc, 1991. Paperback. Small 4to. Stiff yellow pictorial wrappers. ix, 176pp, 34pp. Numerous illustrations. Very good. Mild wear to outer wrappers; "perfectbound" binding anything but, being slightly misaligned at the gutter, though tight nonetheless; inked notes on inside front wrapper from participant. A tight and decent first edition of this rather homespun in-depth history and chronicle of this noted annual cowboying event. Title page signed and inscribed by the event's chairman and five other text pages signed by event officials alongside their portrait or contributions. Unusual and interesting! Chicago: R.R. Donnelley & Sons, 1930. Hardcover. Edited by Timothy Flint with introduction and footnotes by Milo Milton Quaife. 16mo. Burgundy cloth with gilt lettering, rules and decoration. xliii, 428pp. Top edge gilt. Tissue-guarded frontispiece, tissue-guarded full-page plates. Very good. Very faintest of edgewear only, else internally tight and fine. Tight, handsome 28th volume in the annual "Lakeside Classics" series of Americana reprints. First of this edition of the famed and rare account first published in Cincinnati in 1831 chronicling this trader and trapper in New Mexico and the southwest around 1824-30. See HOWES P 123. Chicago: R.R. Donnelley & Sons, 1934. Hardcover. Edited by Milo Milton Quaife. 16mo. Burgundy cloth with gilt lettering, rules and decoration. xxiv, 278pp, (1p ad). Top edge gilt. Foldout frontispiece map. Very good. Bit of edgewear and several spots to binding, with spine faintly sunned, else internally tight and fine; tiny mar at bottom of title page and expert archival repair to foldout map. Tight, handsome 32nd volume in the annual "Lakeside Classics" series of Americana reprints. First of this edition of the journal of the most famed explorer, trader and mountain man (1809-57), first published in Pennsylvania in 1839. Laid in is the fine "With the Compliments of the Season" calling card of Donnelley president Thomas E. Donnelley. Chicago: R.R. Donnelley & Sons, 1928. Hardcover. Edited by Milo Milton Quaife. 16mo. Burgundy cloth with gilt lettering, rules and decoration. xxii, 377pp. Top edge gilt. Captioned-tissue-guarded frontispiece, foldout map, 2 illustrations. Very good. Spine lightly sunned, though internally tight and fine; rear inner hinge archivally mended, thus strong. A tight and quite attractive 26th volume in the annual "Lakeside Classics" series of Americana reprints, keepsakes produced for customers and employees. Bidwell's account (subtitled "An Account of the First Emigrant Train to California, Fremont in the Conquest of California, the Discovery of Gold and Early Reminiscences") was first published in 1914, Steele's (subtitled "Mining Life and Adventure, in California During 1850 and Later") in 1901. See HOWES B 432 and HOWES S 924. Chicago: R.R. Donnelley & Sons, 1948. Hardcover. Edited by Milo Milton Quaife. 16mo. Burgundy cloth with gilt lettering, rules and decoration. lii, 170pp. Top edge gilt. Tissue-guarded frontispiece, tissue-guarded illustration, map. Very good. A bit edgeworn, with endpapers likewise a bit worn. Tight, clean, nice 46th volume in the annual "Lakeside Classics" series of Americana reprints, keepsakes produced for customers and employees. 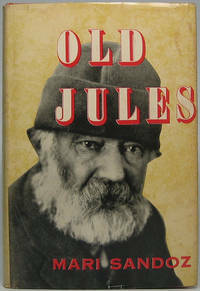 First of this edition, the scarce original account having been published in 1896. Chicago: R.R. Donnelley & Sons, 1941. Hardcover. Edited by Milo Milton Quaife. Translation by George Francis Will. 16mo. Burgundy cloth with gilt lettering, rules and decoration. xxxv, 387pp. Top edge gilt. Tissue-guarded frontispiece, map, 2 tissue-guarded full-page plates. Near fine. Tight, handsome volume in the annual "Lakeside Classics" series of Americana classics. Some are reprints of fabled rarities, others such as this are published for the first time. Chicago: R.R. Donnelley & Sons, 1938. Hardcover. Edited by Milo Milton Quaife. 16mo. Burgundy cloth with gilt lettering, rules and decoration. xliv, 480pp. Top edge gilt. Tissue-guarded frontispiece. Very good. Spine ever-so-faintly sunned, though internally tight and fine. Tight, clean, nice 36th volume in the annual "Lakeside Classics" series of Americana reprints, keepsakes produced for customers and employees. First of this edition, the scarce original account having been published in 1907. Chicago: Breeder's Gazette Print, 1915. Hardcover. 8vo. Burgundy cloth with gilt spine lettering. 322pp. 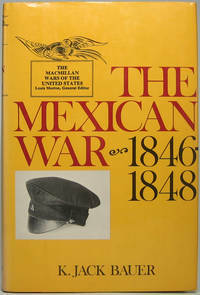 Color frontispiece, numerous full-page plates. Very good. Faint edgewear; 1941 ownership signature on front flyleaf. Tight and nice later printing (minus red title page element, red-ruled text pages and 3/4ths calf binding) of this far-ranging account of the American and British cattle ranchers and breeders who supplied Chicago's (in)famous stock yards, published in the years following Upton Sinclair's 1906 blockbuster "The Jungle" when the federal government was trying to clean up and regulate Chicago's meat-packing industry. RAMPAGING HERD 1996. SIX SCORE 96. New York: Hastings House, 1960. Hardcover. 8vo. Burnt sienna cloth with black spine lettering, pictorial price-clipped dust jacket. x, 424pp. Frontispiece, illustrations. Near fine/very good. Mild jacket edgewear. A tight and attractive 25th anniversary reprint edition of Sandoz's best-known work, the 1935 biography "of her amazing pioneer father." Choice autograph addition: Tipped in before half-title page is a trim-size printed map titled "Working map / of / KANEWA" (a fictional state combining Iowa, Kansas and Nebraska she invented for her 1939 novel "Capital City") on the lower margin of which she boldly inscribes and signs "For Arnold F. Gates / Sincerely / Mari Sandoz" in brown ink, adding beneath a quick sketch of some hills and a prairie flower. (Arnold F. Gates, 1914-93, was a notable Lincoln/Civil War scholar.). Chicago: Breeder's Gazette Print, 1915. Hardcover. Small 8vo. Three-quarter calf with gilt spine lettering and dark green cloth. 322pp. 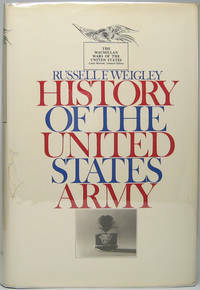 Color frontispiece, numerous full-page plates, all pages ruled in red. Very good. Faint edgewear, but overall tight, bright, lovely. A handsome first edition of this rather scarce far-ranging account of the American and British cattle ranchers and breeders who supplied Chicago's (in)famous stock yards, published in the years following Upton Sinclaur's 1906 blockbuster "The Jungle" when the federal government was trying to clean up and regulate Chicago's meat-packing industry. RAMPAGING HERD 1996. SIX SCORE 96.